At a factory in Memphis, Tenn., he was thinking about the Navy. It wasn’t his first time either. A little more than a year had passed since he separated from naval service and now he missed what it represented and what it could provide for his family. 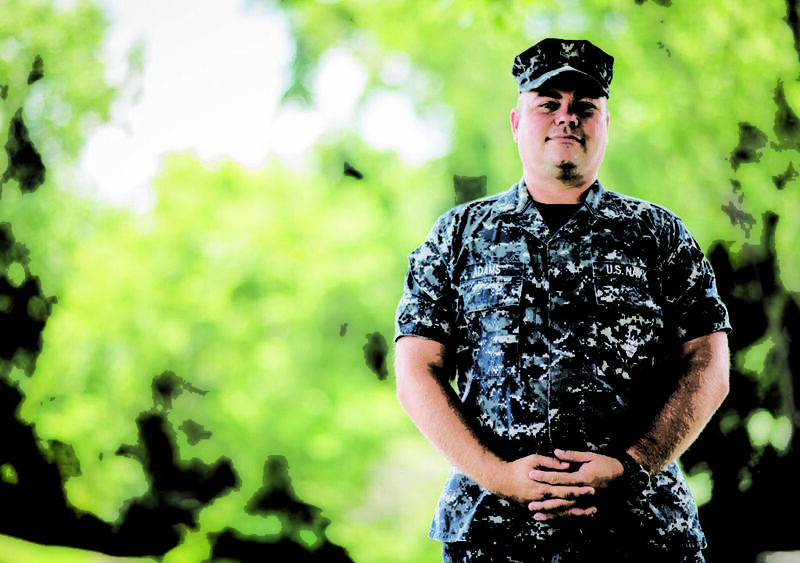 He joined the reserve component and then moved on to active duty. And today he helps others follow the same path. Navy Counselor 1st Class Charles “Greg” Adams now serves as a prior-service recruiter for Navy Recruiting District Nashville from his station at Navy Operational Support Center Knoxville, Tenn.
“It gave me the best of both worlds. I could have a great family life and the Navy life,” Adams said. But his journey began on the other side of the state in his hometown of Bartlett, Tenn., just outside Memphis, Tenn. He left there to join the Navy as an Aviation Ordnanceman in 1998 and served his country while forward-deployed in Japan, working aboard the USS Kitty Hawk (CV 63). After a full tour, he returned to civilian life in Memphis. When he decided that he wasn’t done with the Navy, he started researching how to get back into a uniform. His path was through the prior-service reservist ranks. Shortly thereafter, he became a canvasser recruiter (CANREC) and started recruiting out of Millington, Tenn. Later, he moved to Knoxville, Tenn., and has been there ever since. The long process has enabled him to rejoin the active duty component and make lasting connections along the way. 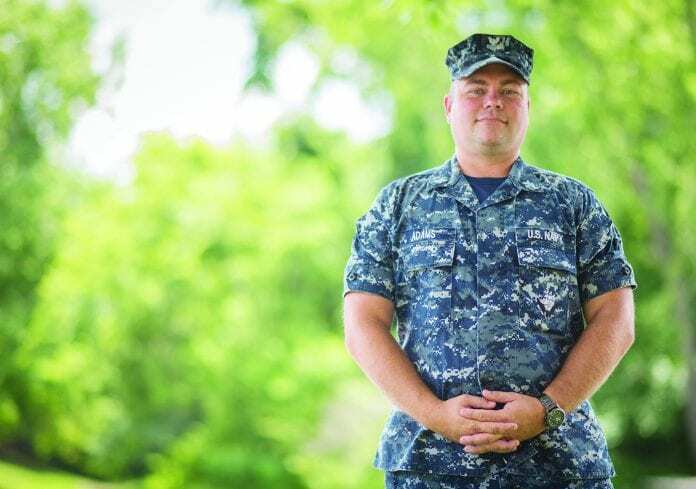 Now with seven children, ranging in age from just under two through 16, he is more grateful than ever at the opportunities that recruiting and the Navy have afforded him. However, the transition from Aviation Ordnanceman to Navy Counselor wasn’t always easy. “It was hard in the beginning but now it is second nature to me. My first leading petty officer used to challenge with a lunch bet to see if I could go and talk to a random person and get them interested in joining the reserves. He helped break me out of my shell and it worked,” he said. He has learned much since those first hesitant interactions with possible recruits. Now he serves as the leading petty officer for all the prior-service reserve recruiting efforts in the district. Just recently he was awarded Navy Recruiting District Nashville’s Recruiter of the Month for the Reserve Component. Along the way, he has lost count of the hundreds of Sailors he has helped put back into the Navy. However, he takes pride in the opportunity that his type of recruiting affords him, particularly being able to see the end result of a long effort. “I often watch the active duty recruiters who send their people off to boot camp and most times never get to see them again. But I put people in and I see them right here in Knoxville on drill weekend,” he said. Sometimes, putting a Sailor back into service poses a logistical challenge, since he or she may have been out of service for an extended period of time. However, those frustrating waits often produce some of the best outcomes for him. This continual reminder of his work has helped inspire him throughout his time in Knoxville and keeps him motivated even as the methods of recruiting continue to change around him. “Ultimately, I help people get what they want. It’s a very gratifying feeling and I’m thankful for it,” he said. Navy Recruiting District Nashville is responsible for recruiting efforts throughout more than 100,000 square miles of the states of Tennessee, Arkansas, Alabama, Georgia, Mississippi, Kentucky and Virginia.